Abstract - One of the most important concerns of software corporations is to protect their products against unauthorized copying. Since all the researchers proposed some copy protection models that all of them have weakness to protect against unauthorized copying. The goal of this study is to propose a new model of serial-based method with more security against illegal usage. This paper offered Online Module model in serial-based method that it spilt the software in two parts. Fist part run in client and second part run in web service, when the software needs to use the second part then the software connect to the web service and the server then checks the software license. If the license has been valid then run the second part. This model compares with online activation models in serial-based method and the results show the proposed model is more secure against unauthorized copying. Abstract - Voice over Internet Protocol (VoIP) services are based on standardized and open technologies (i.e., SIP, H.323) using servers reachable through the Internet, implemented in software and provided often over general purpose computing hardware. Therefore, such services can suffer from various security threats as denial of service attacks. In this paper we present a new hybrid (anomaly and misuse) SIP flooding attack detection algorithm, which overcomes the existing problems in many of other detection algorithms. The proposed algorithm is tested using simulated traffic datasets, and compared with three well known anomaly algorithms and one misuse detection algorithm. The test results show that the new algorithm has high detection accuracy and high completeness. Abstract - Designing and developing a reliable and stable network required installing the right switches in the correct positions of the hierarchical network layers. The identification, acquisition and determination of the right switches required the expertise of highly skilled and qualified network Engineers. However, employing and maintaining such expertise in some of the ICT companies is very challenging. As a result, some companies had to employ less skilled employees in building such a network. Therefore it became a major challenge for less skilled Technicians to identify and determine the right switches for the correct positions within the network layers. It was in view of this challenge that the Switch Hierarchical Network Design Model (SHiNDiM) was fashioned to serve as a tool that automatically identified and indicated the positions of the various switches that were to be installed. The SHiNDiM architecture which used the SHiNDiM SEMINT Specific Parser (SSSP), was intelligently trained to retrieve the targeted switch features. Therefore this tool helped the Technicians who simply entered the variables to be processed and which produced indicators showing the respective positions of switches in the hierarchical network layers. Abstract - The paper presents a solution to distinguish the different applications running on port 80 with HTTP protocol; from that helping firewall to detect the attack and to try to prevent it. This is relatively a typical problem, by there are many different applications such as game, and download, video, etc. are running on HTTP port 80. Filtering based only on port 80 would not realize which application is unallowed and which application is allowed. The solution of this paper is recording all network transactions when the application is running; building a module which analyzes the information, and then organize them into vector information using some of related parameters; using classification C5.0 algorithm (upgrade of C4.5 algorithm) to produce a decision tree; firewall uses this decision trees to identify/distinguish the applications. The testing results on the computer network system of the Information Security Lab (ISeLAB) using 230 transactions; the accuracy reached 99.5%. Abstract - Surrounding noise and interference will effects the quality of speech during communication. To remove this effect and to improve the quality of speech signal, speech enhancement is one of the most used branches of signal processing. For reduction of noise in speech signals, spectral subtraction can be used and it also requires Voice Activity Detection (VAD) to detect the speech components for a given particular instinct of time. This paper deals with real-time implementation of Spectral Subtraction using Weighted OverLap Add (WOLA) filter bank to suppress noise. From the results, it can be analyzed that the noise is efficiently suppressed using spectral subtraction method and Power spectral density (PSD) of noise suppressed signal obtained from MATLAB and Digital Signal Processor (DSP) kit are studied and compared. Abstract - Web services have received much interest due to their potential to design and build complex inter-enterprise business applications. A particular interest concerns dynamic Web services composition that offers the opportunity for creating new Web services at runtime from those already published. In this paper we focus on mismatches occurring during dynamic composition of Web services. These mismatches require adaptation to insure the correct working of the involved components in the service composition. We propose an approach for dynamic and automatic composition and adaptation of Web services. The approach is based on the information that is already available in interface descriptions. The approach allows programmers to define dynamic Web service composition and adaptation without changing the source code. 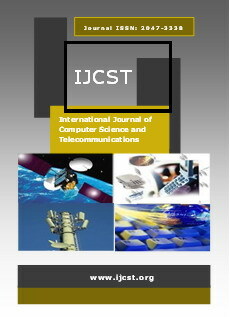 Abstract - Worldwide Interoperability for Microwave Access (WiMax/ IEEE 802.16), is new technology based on wireless metropolitan area network. Privacy Key Management (PKM) protocol is responsible for providing the secure distributions of keying data from Base station (BS) to Subscriber station (SS). PKMv1, PKMv2, and enhanced PKMv1 described with formal analysis and verified using Scyther tool . PKMv1 is vurnable to replay, DOS, Man-in-the middle attacks since there is no mutual authentication. The proposed design is more secure to prevent the network from the previous attacks. A simple implementation is done using Wireless Open Access Research Platform (WARP) and programming language C#.NET. Abstract - Layered decoding is known to provide efficient and high-throughput implementation of LDPC decoders. The Check-Node Layered Belief Propagation (CL-BP) algorithm is a modification of Belief Propagation algorithm (BP), where the check nodes are divided in subgroups called layers and each iteration is broken into multiple sub-iterations. Some simplifications can also be made to lower the complexity of both BP and CL-BP algorithms, and particularly the complexity of the check node update rule. In this paper, we consider The Check-Node Layered Belief Propagation (CL-BP) decoding and propose efficient Variable-Node Layering (VL-BP) for updating extrinsic information based on corrective terms. Simulation results show that good performance can be achieved, and which can even be improved by the addition of a normalization term or an offset adjustment term. Abstract - Digital Image Processing means processing of digital images by using a computer via algorithms. Noise corrupts the image during sensing with malfunctioning cameras, storing in faulty memory location, or sending through a noisy channel. Sometimes intensity of noise with which an image can be corrupted is different in its various areas. The main objective of this paper is to develop a faster and better algorithm for suppressing salt and pepper noise in different areas of interest from noisy images. This paper proposes a method for noise suppression using a Local Parameterized Adaptive Iterative Model in areas of interest. The proposed method provides good results subjectively as well as objectively for both gray scale and true colour images. The proposed method is useful for interactive image processing applications as it has a family of possible denoisy images for a single noisy image. Abstract - Handwriting recognition refers to the identification of written characters. Handwriting recognition has become an acute research area in recent years for the ease of access of computer science. In this paper primarily discussed On-line and Off-line handwriting recognition methods for Arabic words which are often used among then across the Middle East and North Africa People. Arabic word online handwriting recognition is a very challenging task due to its cursive nature. Because of the characteristic of the whole body of the Arabic script, namely connectivity between the characters, thereby the segmentation of An Arabic script is very difficult. In this paper we introduced an Arabic script multiple classifier system for recognizing notes written on a Starboard. This Arabic script multiple classifier system combines one off-line and on-line handwriting recognition systems. The Arabic script recognizers are all based on Hidden Markov Models but vary in the way of preprocessing and normalization. To combine the Arabic script output sequences of the recognizers, we incrementally align the word sequences using a norm string matching algorithm. The Arabic script combination we could increase the system performance over the excellent character recognizer by about 3%. The proposed technique is also the necessary step towards character recognition, person identification, personality determination where input data is processed from all perspectives. Abstract - A DoS (Denial of service) attack is characterized by an explicit attempt to prevent the legitimate use of a service. These attacks overwhelm the processing or link capacity of the target sites by saturating them with bogus packets. Such attacks can seriously disrupt legitimate communications. These attacks can disrupt the availability of Internet services completely, by eating either computational or communication resources through sheer volume of packets sent from distributed locations in a coordinated manner or graceful degradation of network performance by sending attack traffic at low rate. Distributed Denial of Service (DDoS) Attacks, when an attacker attacks from multiple source systems, it is called a Distributed Denial of Service (DDoS) attack. The actual owners are usually not aware of their system being used in a DDoS attack. DDoS (Distributed Denial of Service) attacks are amplified form of DoS attacks where attackers direct hundred or even more zombie (Slave) machines against a single target. DDoS attacks have two phases: Deployment and Attack phase. DDoS program must be deployed on one or more compromised hosts before attacks are possible. The several mechanisms are available to mitigate DoS/DDoS attacks. In this paper, it is proposed a design of a framework or a mechanism for defending against Denial of Service attacks, have become one of the major threats to the operation of the Internet today. The IPtables is a Linux kernel based packet filter firewall. IPtables modules are present in the kernel itself, there is no separate daemon for it. This makes it very fast and effective firewall. The IPtables rules control the incoming and outgoing traffic on a network device. This design will be based on firewall for detecting and preventing the most harmful and difficult to detect DoS attacks. The firewall that can distinguish the attack packets (containing source addresses) from the packets sent by legitimate users, and thus filters out most of the attack packets before they reach the victim. The firewall scripts are written using command-line tool IPtables in Linux to deny the suspicious traffic. Packet sniffer tool will be used to display the effectiveness and performance of the scripts in mitigating the various kinds of DoS attacks.